One hundred years ago today . . . on this date in our extended family history . . . the 23rd day of January . . . in the year 1911 . . . the 5th of seven daughters is born to Charlie and Emma Patience (Nettles) Muston . . . Nona Amy is the youngest in the photo shown here . . . the next daughter after Nona was born in 1913, and then one in 1915 . . . which was the same year Charlie died, leaving Emma to raise seven daughters on her own . . . the sister standing behind and to the left of little Nona is my paternal grandma, Ima Lois Pounders nee Muston (1906-1999) . . .
FYI . . . the quilty-looking background for this collage was created from my photo-of-the-day for today . . . I used techniques from both Picasa and IrvanView for this project . . . Happy Birthday Nona...and your collage from your stained glass photo-of-the-day, came out beautiful Vickie. 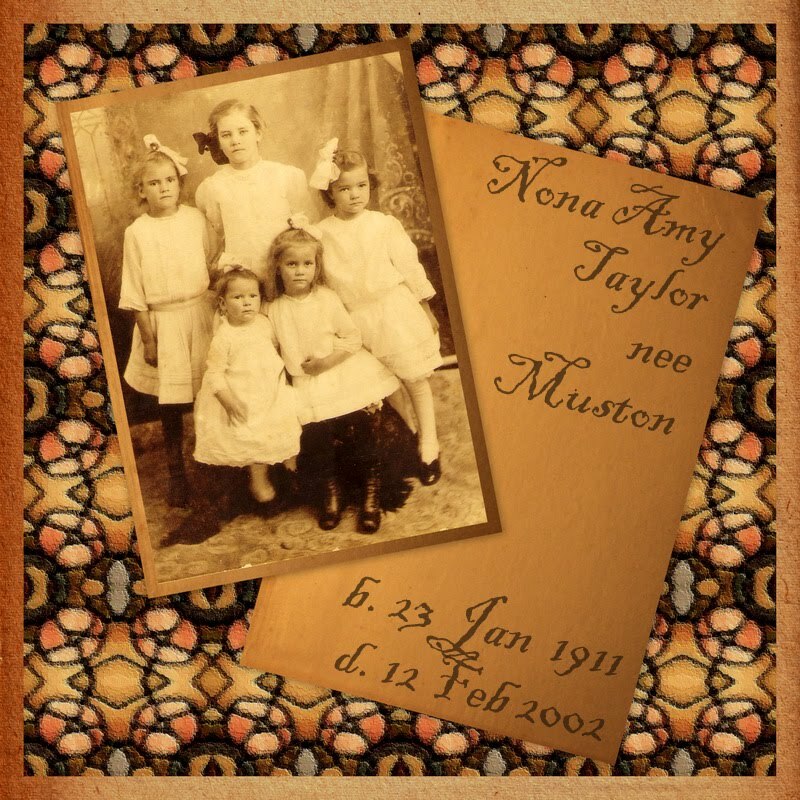 This quilty-looking background was quite appropriate for Aunt Nona's 100th birthday . . . among other endeavors, Grandma Emma quilted for money in her efforts to take care of her seven little girls . . .